Since I took a 4 weeks vacation, and I’m getting really bored, it gave me time to push a (muuuuch) needed upgrade to this blog and to publish a couple of posts. I wanted to publish a few posts on multiverse for a long time. I stole the title of this series of post, “On hidden realities”, from Brian Greene‘s excellent book “Hidden reality“. Keep in mind that this subject is from many aspect highly speculative. Even more, a few hypothesis cannot be tested (for now, or for ever), which mean some parts may not be science at all. Let’s recall Occam’s razor “law of parsimony” principle: “among competing hypotheses that predict equally well, the one with the fewest assumptions should be selected. Other, more complicated solutions may ultimately prove to provide better predictions, but—in the absence of differences in predictive ability—the fewer assumptions that are made, the better “. Nevertheless, it also important to keep an open (but critical) mind: some of these assumptions can actually be tested, and may lead to better to better predictions or new physics. Furthermore, some may also argue that (in terms of Kolmogorov complexity) a multiverse may be simpler than a single universe, and thus, precisely according to Occam’s razor, should be looked at. There is a bit of buzz around multiverse theories. Partly because of the our current inabilities to build theories that could tackle and give new insights to important subjects like quantum gravity or dark matter. Partly because it’s fun too. There is a whole taxonomy of multiverse theories, and some of them my rusty brain of old physicist cannot grasp enough to explain back them in layman’s terms. Yeah, I turned 44. I’m a fossil. Let’s start at the quantum level. In 1957-58, Hugh Everett proposed an interpretation of quantum mechanics in which all possible alternate histories are real, each representing an actual universe. The term “many-worlds” was actually coined by Bryce DeWitt later on. This hypothesis states there is a very large number of universes, and everything that could possibly have happened in our past, but did not, has occurred in the past of some other universe (or universes). does not actually predict in which state the system will be when it will be measured. It predicts the evolution in time of the probabilities to measure the system in a given state . Each time the system is measured, the system is found to be in one of the possible states of the system. After many measurements and collecting each time a given state is obtained, the measured probabilities nicely fit the predictions of Schrödinger’s equation. In classical terms, a wave function collapse is said to occur when a state, initially in a superposition of several states appears to reduce to a single state. This have been wildly popularized thanks to Schrödinger’s cat thought experiment: “a flask of poison, and a radioactive source are placed in a sealed box. 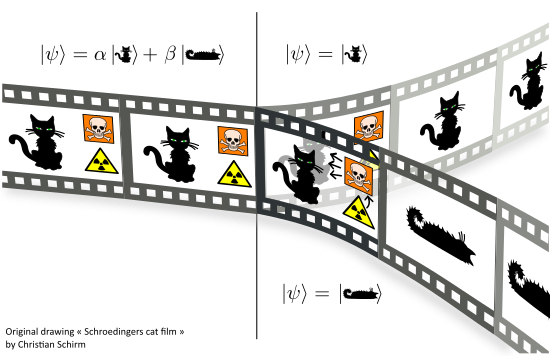 If an internal monitor detects radioactivity (i.e measures a quantum event), the flask is shattered, releasing the poison that kills the cat” [wikipedia]. Shrödinger’s cat is a two-state system (dead / alive). Of course, this could be extended to more complex states. This was brilliantly illustrated in on of CBS’s show the Big Bang Theory‘s episode (The Closet Reconfiguration). 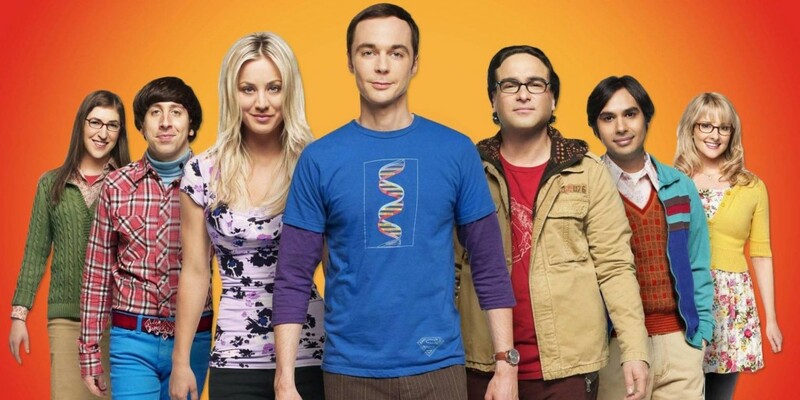 In this episode, Sheldon finds an old sealed letter from Howard’s father and reads it. He then tells all the gang (but Howard) the content of the letter, which upsets Howard (his father left the family when he was eleven) : everybody knows the content of this letter, while he, on the other hand, doesn’t want to know anything about the message (that is why he kept it sealed). To solve this conundrum, all his friends gathers. Each of them tells Howard a different story about the content of the letter. Only one of them is true. He will never read the message, and never know which of the stories is true. For ever, his father’s history will be a combination of all these stories. This poses the question of when exactly quantum superposition ends and “reality” collapses into one possibility or another. Hugh Everett, and later on Bryce DeWitt or David Deutsch, denies the actuality of wave function collapses. He was not the first physicist to criticize the Copenhagen collapse postulate, but he broke new grounds by deriving a mathematically consistent theory from the equations of quantum mechanics itself. The Copenhagen interpretation relies on the presence of an observer (not necessarily a sentient observer) capable of “initiating” a wave function collapse (i.e quantum measurement). Everett’s theory removes the observer-dependent role in the quantum measurement process by replacing wave function collapse with quantum decoherence. Simply put, decoherence is a process through which quantum superposition in a system is washed out due to coupling to an environment. It neatly solves Schrödinger’s cat problem. Everett’s interpretation has no issue with the cat being simultaneously dead and alive : it just spins the two results into two different worlds. Despite potential benefits, the Everett’s many-worlds interpretation faces a huge challenge : there’s no way to test it experimentally, which makes it unfalsifiable (in Karl Popper‘s terms). Indeed whether a physicist uses good old-fashioned Copenhagen interpretation, or any Everett-like interpretation, calculations will lead to the same predictions. Arguably, until such a proof exists, these interpretation are more a question for philosophy than for science. Nevertheless, in the late 80’s, Bruno Marchal, Hans Moravec and Max Tegmark (independently) developed a Schrödinger’s cat-like thought experiment in attempt to distinguish between the Copenhagen and the many-worlds interpretations. This thought experiment is usually referred as “quantum suicide” (or sometimes “quantum immortality”). In this thought experiment, the experimenter is placed in a chamber with a life-terminating device connected to a quantum apparatus. 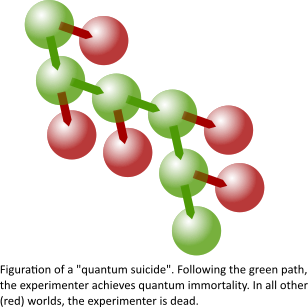 Every ten seconds, the spin value of protons is be measured by the apparatus. Depending on the result (a 50/50 chance of either measurement) the device will either fire (and kill the experimenter) or emit an audible “click” (and the experimenter survives). This is essentially repeated Schrödinger’s cat experiments, with … a human experimenter as a cat. From Everett’s perspective, there is a 50% survival chance at the initial round, and the experimenter has the same chance for every subsequent repetition of the experiment : no matter how many times the experiment is repeated, half the time, the experimenter survives in one world. Note that the overall survival probability follows the same exponential law as for the Copenhagen perspective. There is of course many drawbacks to this thought experiment. The first being attempting to (repetitively) commit suicide, which is clearly not a good idea, even for the sake of science. The second is that it would prove the many-worlds existence only to the experimenter. And the third, is that even if the experimenter achieves some kind of immortality, he will nevertheless suffer the aging process, much like Tithonus suffered. From what we know, Everett’s point of view doesn’t really bring any new physics. But it certainly brings new perspectives and ideas. And actually, the many-worlds perspective has been a great source of inspiration for authors and film makers. To conclude in a poetic way, let me point out Jaco Van Dormael‘s excellent film and tale about choices “Mr. Nobody“. The film takes a four-dimensional view of the nature and existence of life. In this film, each decision branches off, creating an entirely separate alternative universe. In all life-or-death decisions, Nemo / Jared Leto finds that he has chosen life. Good or bad, each of these lives have meanings and consequences.